I am amazed at all I have learned in China. In order to produce one pound of beef, the cattle must be fed with 45 pounds of grain. To produce one pound of pork, a pig needs only 17 pounds of grain. Though pork is the cheapest meat and almost every family in China includes pork at its table, I read about families that will never eat pork. These families live in Kaifeng. In the travel guide I was carrying, it mentioned that once there were Jews living in Kaifeng and today the only remaining evidence of this people is a street called “Teaching the Torah Lane” and a forgotten hatch of a mikveh. I decided to see Kaifeng for myself. 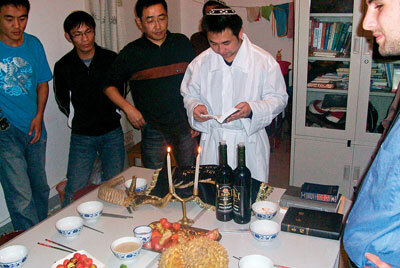 It is a small Jewish world, even in China. I start by contacting an Israeli that was living there and he recommended I come on a Friday. What was waiting for me was not just a place with Jewish memories but a place with a contemporary Jewish atmosphere. Around the table there were nearly 30 people, most clearly dressed in their best. I was shocked when Yage Wang (or Yaakov as he is better known) began reading in Hebrew, the familiar sounds of the text of the Friday Kiddush filled the room. When everybody excused themselves to wash in the traditional Jewish manner, I remained stunned. Where was I? Home in Israel? When Heng Shi (Tzuri) recited the Hamotzi over the munto (a Chinese bun) I again returned to China. Kaifeng was once the capital of China and a main station along the Silk Road. Around 1000 years ago a group of Jewish Persian merchants looking for a place to settle along the Silk Road were welcomed to Kaifeng. They established a subcommunity and eventually completely assimilated. Up until a few years ago, nearly the only connection to those original merchants was the unique last names the Chinese Emperor had given all the Jews so long ago. Though they still didn't eat pork and were told of grandmothers lighting candles on Friday nights, there was no connection to the symbolism of these acts. I am told that a few years ago a group of curious Americans had initially helped revive Jewish life there. The community I find is thirsting for Jewish knowledge and tradition. I settle in and soon find myself filling many different roles. I am a Hebrew teacher, rabbi and cantor. I affix Mezuzahs. I share recipes. I find my niche in every role left unattended. Since they don't really speak English, each class or message had to be translated by Gui-yan (Esther). This presented a difficulty but the desire to learn was strong. I am bothered not by these technical difficulties but by much bigger issues. I am concerned that every message and lesson I pass on is biased by my own background. I am also still exploring my own Jewish identity so who am I to instruct theirs? I find I need to dig deep, and also rely on the knowledge of my relatives through quickly exchanged emails. I question the essence of my purpose in volunteering. In the beginning it was merely because it felt like the right thing to do. I begin to have deeper questions. Is it necessary to complicate their lives in light of the fact that Judaism doesn't recognize them as Jews? And is it even permissible in Judaism to help them keep mitzvahs? Other thoughts arose also. What was their motivation? Were they mainly interested in the money that they were now getting? Were they just hoping to get to Israel? While I asked myself these questions and searched for proof, I already knew the answers. Like my intention to help for the right reasons, these Jewish descendents had pure intentions too. There were plenty of reinforcements for my belief: the seriousness of Tzuri when he made Kiddush, the holding to the Yom Kippur fast despite how very organized and serious the Chinese are about their timetable for meals, and the communal effort to build the sukkah. It was the first sukkah in the town in 100 years. I see proof in the money that these families spend on Friday night meals and the bustle and scents that Shabbat brings as if it was a neighborhood in Jerusalem. Most of all the determination stands out. I see them thrive for knowledge. They listen carefully and absorb all the Jewish knowledge they can. This has all reinforced my motivation to return to Kaifeng to help out for a third time. It is hard to stay indifferent to the donations they have collected on their own for the rehabilitation of the Carmel Forest. It is hard to stay indifferent to the warmness they treat every Jew and it is hard to stay indifferent to the pride that belonging to the broader Jewish community gives to them.